A workshop without a bench is a workshop that’s of little use. So how do you make an effective, low-cost work bench? 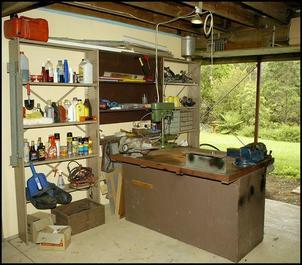 If you visit any major hardware store, you’ll see plenty of commercially available work benches. Just pay your dollars and take one home. The trouble is, most of these are absolutely useless. They are weak, too light, won’t be durable and are often the wrong height. So, before I get into building a work bench, what features should your bench have? Picking the correct bench height is vital. That’s especially the case if you’ll be mounting a vice on it. 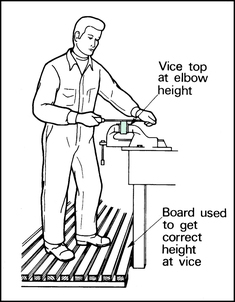 The top of the vice should be near to the height of your elbow when you’re standing upright with your arms by your side. That’s because when you place an item in the vice and file it, you’ll have greatest control if the item is at that height. So when setting bench height, start off with the largest vice you’ll be using and work backwards from there. A bench should be made as massively heavy as possible. A well-built bench will be heavy as a matter of course (more on construction in a moment) but having the bench heavy is something to aim for in itself. Why? A major reason is that when using the vice, you want it to behave as if it’s part of planet Earth! Pushing and pulling on the bench shouldn’t move it at all. All benches should be built super strong. There are three reasons for that. Secondly, you don’t want the bench-top to deflect when you’re hammering something on it. Whether you mount a small anvil on the bench, you’re using a hammer on an item in the vice, or you simply want to centre-punch something sitting on the bench surface – in all cases, the less the bench deflects, the better. Finally, a strong and well-built bench will be exceptionally durable. 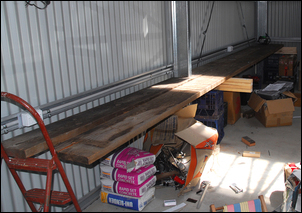 In my new home workshop, the first job was to recondition an existing bench (shown here in a previous home workshop). An ‘island’ type, I first build this bench something like 20 years ago. It uses a steel welded frame, substantial timber rails and bench-top supports, and a 25mm thick particle board top with an inlay of Masonite compressed particle sheet. 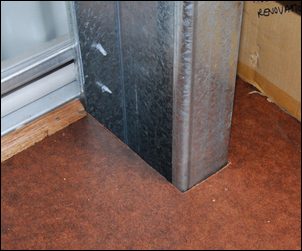 Around the top is an edging formed from steel angle. This bench is about 1.5 metres long and 1 metre wide. 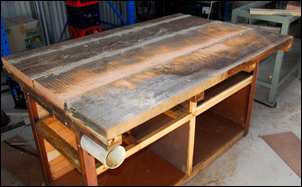 Over time the bench has stood up to hard use very well, but being out in the weather during the period it took to build the new workshop meant that the particle board top degraded. The internal shelves were also getting a bit droopy – and, well, it was time for a revamp. The first job was the rebuild the base of the bench. In order to make the bench heavier, I typically place very weighty items on the bottom shelf. In fact, it’s not uncommon for there to be 50kg on each of the two bottom shelves. The original bottom shelf comprised just particle board and a few timber supports, so over time the shelf sagged. As this pic shows, I made a new supporting frame from 70 x 35mm pine, so that the new shelf (formed of 5mm Masonite) is very well supported. The timber pieces were cut to size and then glued and screwed to the original timber supporting rails. As the salvaged timber had slightly warped, the top surface was then levelled. A plane (either power or hand) or a big belt sander could have been used, but as I didn’t have either handy, I used the teeth of a sharp hand saw to gain a flat surface. I then remounted the surrounding angle steel frame and replaced the Masonite working surface, using 5mm thick material. With new end and back panels fitted, the bench should be good for another 20 years! 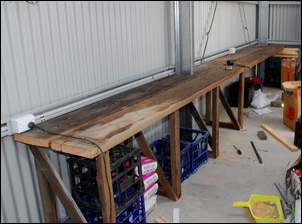 One exception to the ‘cheap commercial benches are all crap’ mantra may be to build a workbench using pallet racking. 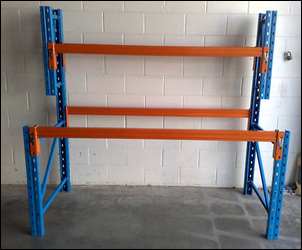 The racking shown here – available on eBay for AUD$240 – could be used together with a heavy timber bench-top and shelving to form a durable and strong workbench. It’s worth investigating if salvaged timber is not readily available. The other bench within the workshop is of new construction. 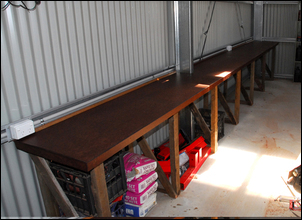 It is a ‘linear’ bench that runs along half the length of the back wall of the workshop. The first step was to lay out some of the same long, thick planks that I’d used to form the bench-top of my ‘island’ workbench. Using supporting milk crates and a small step ladder, I placed the planks at a height that I thought would be effective (in this case, 870mm to match the power points and wall girt). At this stage I also assessed the width that I wanted, choosing to go for a slightly narrower bench (590mm) than I’d originally considered. The bench is 6 metres long. With the planks at the correct height, I could then start building the supporting legs. I used 70 x 50mm hardwood (again salvaged from the old sheds) to form rectangular frames, each rebated on the uprights. The joins between the uprights and the cross-pieces were screwed. To give greater stiffness, I placed a 70 x 25mm hardwood diagonal on each frame, again screwing it into place. 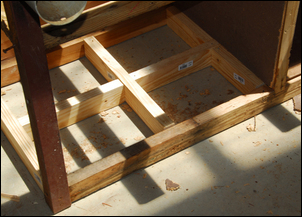 The frames were made on the flat concrete floor and then inserted under the supported bench top. 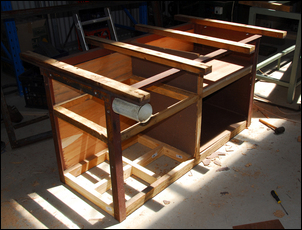 As the frames were placed into position, they were attached to the bench-top by long screws inserted from the top. In other words, the bench was constructed in situ – it would be much too heavy to build it elsewhere and then move into place. The seven supporting frames were then dyna-bolted to the concrete floor, using two 12mm bolts on each frame. A hired hammer drill was used to drill the holes in the concrete. The floor spaces between the frames are completely clear – this allows boxes or crates to be easily slid under the bench-top for storage. Lengthways movement of the bench is resisted by the frame of the shed, around which the bench-top fits very snugly (a light hammer push-fit, in fact). The bench top is formed from 5mm thick Masonite. 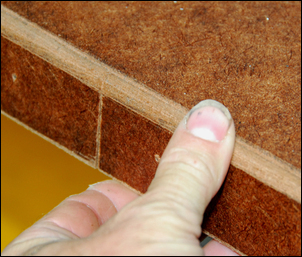 This material is replaceable, quite hard (unlike plywood, it can be hammered without easily denting) and gives a smooth top surface. The leading edge of the bench-top was also trimmed with Masonite. 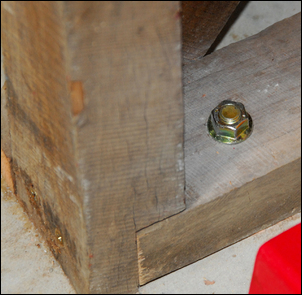 Quarter-round timber was used along the rear edge of the bench-top – this prevents screws and other small items falling off the back of the bench. The bench top was then oiled. 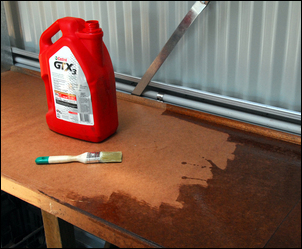 I just use any new unwanted engine oil I have around place – in this case, Castrol GTX. The oil is applied with a brush, left for 15 minutes to sink in, then any surplus is wiped off with a cloth. The resulting surface is dry to the touch, doesn’t show oil stains(! ), and can be easily touched-up should it be scratched. 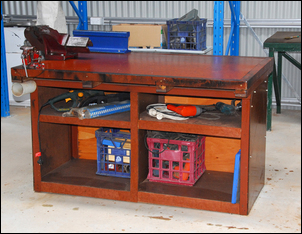 The finished work bench. 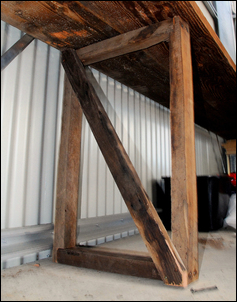 Using the salvaged timber, and including part of the hire cost of the concrete drill (also used to install the pallet racking), it cost about AUD$175 to build. 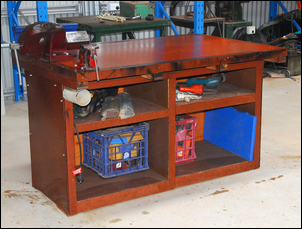 The bench is sturdy enough for tools like vices and grinders to be bolted straight on. However, note that for really heavy hammering, additional longitudinal rail supports beneath the top should be used. In this workshop, the majority of the work occurs on the island bench. On this bench are mounted two vices and a short length of railway line used as an anvil. 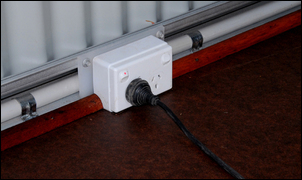 On its internal shelves are placed heavy items like portable power tools. 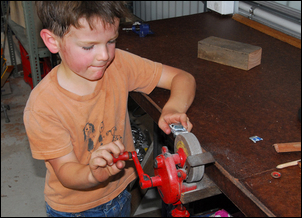 On the linear bench are mounted a woodworking vice and a small hand-turned grinding stone. (These are used by my 7 year old son.) Further along this bench are mounted a pipe-vice and a set of metal shears. This bench is also conveniently to hand when working on a car parked in the workshop. Stored under this bench are heavy items packed in milk crates and cartons. Minuses: They don’t look like you-beaut store-bought benches?